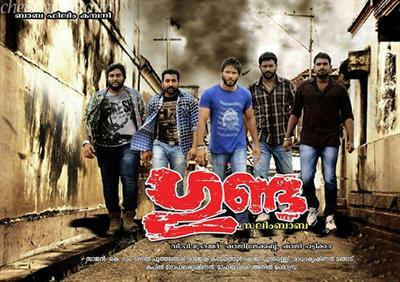 Gunda malayalam movie directed by Salim Baba will feature a bunch of yound blood in lead. The movie produced under the banner of Baba Films is having Binu Pappu, Shibu Thilakan, Robichan Machan, Sudeer Karamana, Sandeep Sasi, Ajo George, Jubily Rajan P Dev, Genkis Khan, Diljith Dileep and Priyan donning important characters. Set in the background of revenge and murder, this movie is made with an action touch. The film is also blessed with the presence of Sreenivasan, Kalabhavan Mani and Tini Tom. Even though a number of movies featuring the children of movie actors in lead have released, it would be a rare occasion for a bunch of youngsters to come together in a single frame. Salim Baba who had acted in more than 600 movies in various languages is offering an action thriller which would also be the launch pad of 15 young bloods. Titled 'Gunda', the movie packed with action and thrills is gearing up for its release. The movie produced under the banner of Baba Films is having Binu Pappu, Shibu Thilakan, Robichan Machan, Sudeer Karamana, Sandeep Sasi, Ajo George, Jubily Rajan P Dev, Genkis Khan, Diljith Dileep and Priyan donning important characters. 'Gunda', set in the background of a port named Puthiyappa Harbour which is near to Kozhikkode city. The story revolves around two persons who where once partners in business but later turned to be enemy of each other. The revulsion between them, takes and edge forward with both trying to destroy their empires. Padaveedan and Jagannadan were friends and were partners in business. As the business deal ended in loss, they broke apart. Having equal balance in power, they made attempts to eliminate and destruct each other. As C.I Thampaan who favoured Padaveedan took charge of the police station, Jagannadan had to pull back. Jagannadan tried yet another way to purge Padaveedan, it paved way to create some problems in their lives. With the help of Sidharthan, Jagannadan makes an attempt to demolish Palayam Hamsa. As in jail, Hamsa send 5 of his associates to destroy the vast empire of Padaveedan. For financial matters, Hamsa and Jagannadan turn for a scuffle. As Jagannadan and Padaveedan lose their influence among the public, they join together to fight against their common enemy. Rest of the story finds a new path with interesting twists and turns. Due to family constraints, a group of youngsters who have to follow the path of crime forms the crux of the movie. With revenge and murder added to the story, 'Gunda' is having lot of action sequences which would spellbind the audience and keep them intact. Sreenivasan, Kalabhavan Mani, Tini Tom, Sunil Sugadha, Rasheed Kottayam, Amjath Moosa, Pravi Nair, Saju Kodiyan, Vinod Koovoor, Prakash Payyanikkal, Majeed, Yavanika Gopalakrishnan, Kalabhavan Pradeep Lal, Gangaji Nair, Ansiba Hassan, Seenath, Rama Narayanan and Rashmi Praveen will give life to other prominent characters in the movie. The story, screenplay and dialogues are written by V.P.Mohammed.